GE Fanuc Intelligent Platforms announced the availability of the latest version of its award winning Proficy Machine Edition programming software. 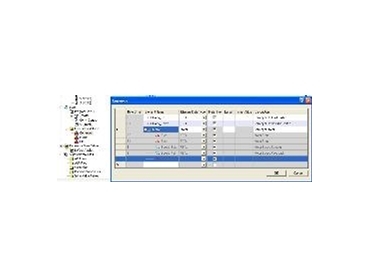 Proficy Machine Edition is a universal development environment for HMI, motion, and control applications that all share a single workspace and tool set. Coupled with an efficient, user-friendly structure and standardized user interface, Proficy Machine Edition is designed for ease-of-use and quick time-to-solution for the entire project lifecycle. From configuring and developing to commissioning and maintaining, Proficy Machine Edition 6.0 increases the efficacy of applications providing users with a sustainable advantage for their business. Proficy Machine Edition release 6.0 is all about making it even easier for users to simplify programming, speed the time-to-solution, and enhance the overall object oriented programming capability. They are adding features that will enable users to increase their programming efficiency and reduce initial errors, so that they can complete their projects and realize revenue from their applications more quickly. Included in the Proficy Machine Edition 6.0 release is the ability to create User Defined Data Types, allowing users to create data structures that represent real world equipment and objects. This feature may contain basic data types such as integers, real numbers, Boolean variables, or other User Defined Data Types. All of the structure elements can be referenced individually as well as a whole, and individual elements or the entire structure can be passed to a function block. Together with our award winning Tool Box feature, User Defined Type provides our customers with a powerful object oriented programming environment that will significantly reduce their application development time and increase their productivity. Also included in the Proficy Machine Edition 6.0 release is Variable Indexed Arrays. This allows users to index an array of basic type and User Defined Type using a variable in Structure Text, Function Block Diagram, and Ladder Diagram environment. Variable Indexed Arrays provides an important tool that will enable our customers to develop modular and reusable code. Companies want a powerful, object based development environment that is simple to use, so that they can develop great applications for their end users. Proficy Machine Edition 6.0 provides them that ability, making it easier to realize the benefits of their application throughout its entire lifecycle.